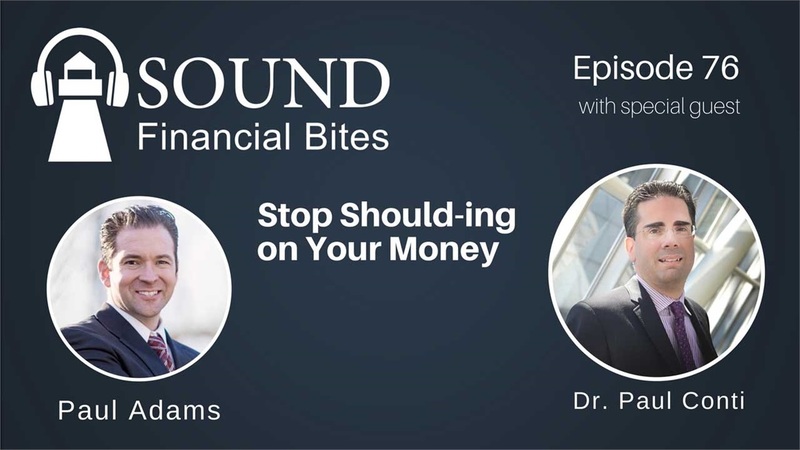 On this episode of Sound Financial Bites, I speak with Dr. Paul Conti. Dr. Conti is a General Psychiatrist, treating all aspects of mental illness and the impact of life stressors. He is a graduate of Stanford University School of Medicine and he served as Chief Resident at Harvard. Named one of Oregon’s top psychiatrists in 2008, he also has practices in Los Angeles, New York, and Portland. Dr. Conti also provides business-related and legal consulting services to his clients and today he shares his knowledge of money and its impact on the human psyche. We talk about money being the new stressor in people’s lives, how powerful marketing tells us we aren’t good enough and need to do better, the problems more money brings and how to address them and how the seemingly innocuous word, ‘should’ is damaging our society. 02:50 - More money, more problems. Money as the new stressor. "I think it’s the idea that money solves problems that makes people feel… a sense of embarrassment over having it." "What word encapsulates the most misery and damage in modern society? It absolutely is the word, should." "We are assailed all the time by information that tells us that we should have more." "I see people who are tortured by this constant feeling of insecurity and money does not protect a person from that." "The biggest place for mental health in wealth accumulation is for all of us in staying well grounded."